At the height of his popularity, Michael Jordan was more than just an athlete. He was an icon, a cultural phenomenon the likes of which the world had never seen, and arguably the most recognizable human being on the planet. As such, there have been innumerable biographies of the athlete, but none quite like the one Wilfred Santiago has created. 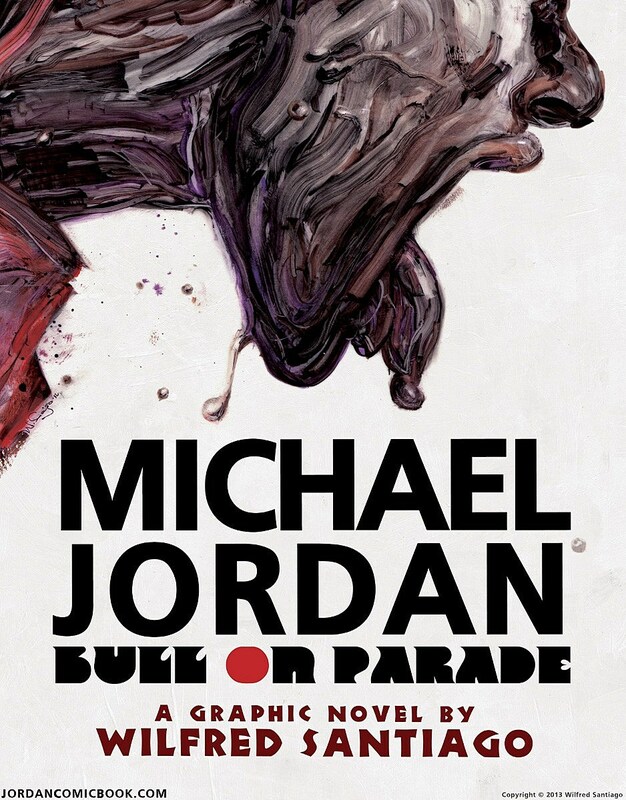 After the critical success of 21: The Story of Roberto Clemente -- Santiago's previous comic book biography of a legendary sports figure -- Fantagraphics is now announcing Michael Jordan: Bull on Parade, Santiago's follow up work which examines the career of the greatest athlete of the 20th century. 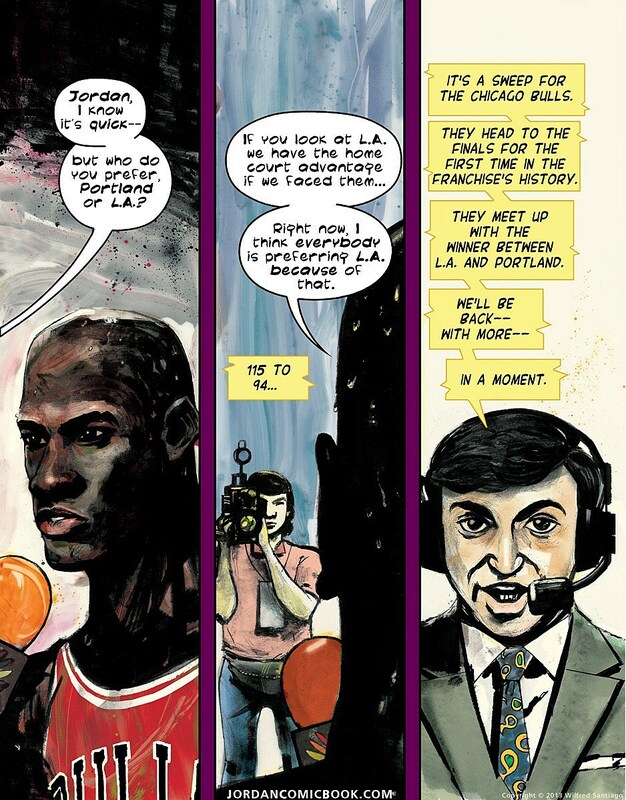 Fantagraphics has provided ComicsAlliance with preview pages of the book, which goes on sale in the Spring of 2014, and I spoke with Santiago about recounting the legend, both on and off the court, of this generation's greatest athlete. ComicsAlliance: As someone who grew up watching the NBA, I've always had mixed feelings when it comes to MJ. Were you a Jordan fan growing up? Wilfred Santiago: No. I wasn't. 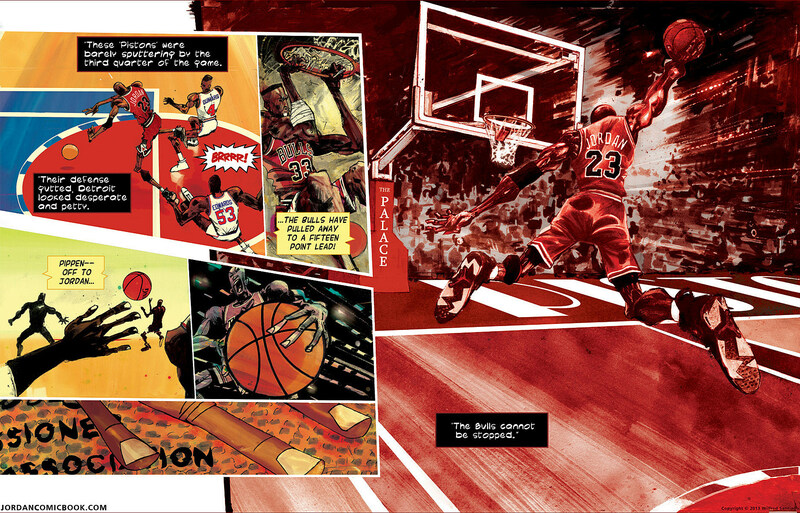 The interest in doing a graphic novel about Jordan stems from his abilities and game and the potential to develop that into a narrative. Your mixed feelings are understandable and a pretty common condition, but in most cases it had nothing to do with Jordan's skills and achievements as a player which is at the heart of the book. CA: At one point, you could have made a legitimate argument that Michael Jordan was the most recognizable person on the planet. And while he's still an incredibly popular and influential figure, he hasn't been at his peak in a number of years. What made you want to put out this book now? WS: The idea is to do a trilogy of biographies, Jordan being the second and the third being a web comic about abolitionist John Brown. Michael Jordan was chosen as a subject because it's a unique story about a trail blazer. And basketball is a great sport. A hundred years from now you still won't be seeing anything quite like the Jordan phenomenon at its height. And of course, for good or ill there's his legacy that still reverberates today. Now is the time because a book like this has not been done before. CA: There's obviously been a lot written over the years about Jordan off the court, good and bad. How much do you plan on focusing on his life outside of basketball? WS: There's enough to get a wholesome portrait of his impact and there are enough angles of a Jordan not that well known. It is safe to say that for most people, personal drama has the potential to influence their profession. That could be good or bad. Jordan did pretty well on the court. Despite some tough trials and tribulations in his personal life, his game was always constant on his run with the Chicago Bulls, still that tension persisted. 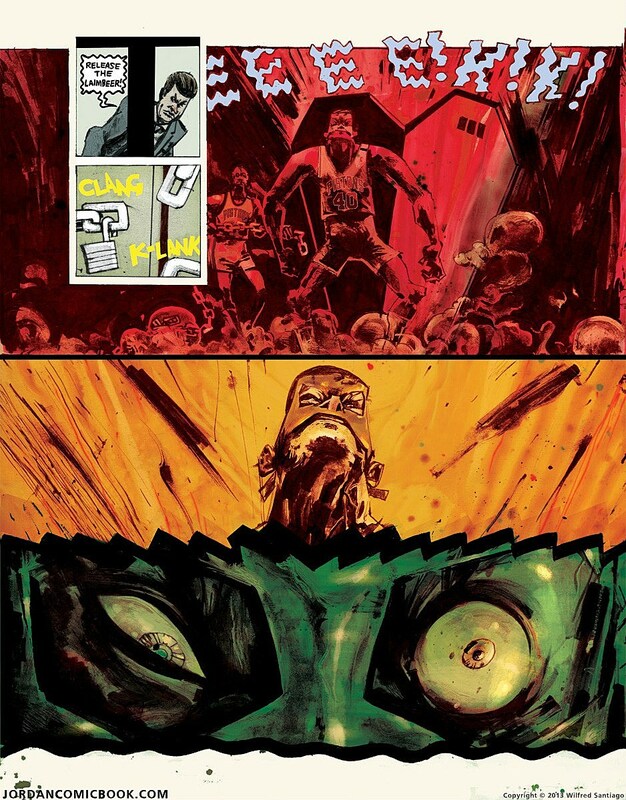 CA: You previously did a comic about Roberto Clemente, but while the two were both amazing athletes, they are viewed in very different ways. Clemente was an outspoken humanitarian who inspired many athletes who followed him to do similar work, whereas some believe Jordan ushered in an age of almost social indifference among today's star athletes. What was it like going from the Clemente book to this? WS: Exciting. You have an action packed game and a character with a spectacular story who dominated the 1990's, as far as pop culture figures go. Also, unlike Clemente, Jordan is alive. It's potentially awkward to write a biography about someone who is still around, but obviously, whatever he was going to do as a player, that stage of his life is gone. 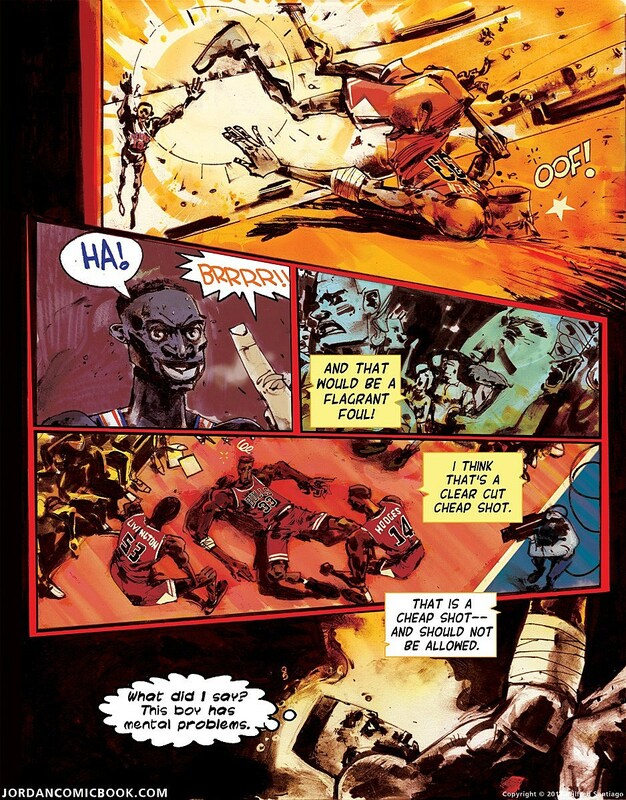 CA: The art looks great, and the tone definitely jumps between exaggerated (Detroit Pistons player/Jordan nemesis Bill Laimbeer being released from a cage to attack the Bulls) to a bit more straightforward (Jordan doing a postgame interview with Marv Albert). How do you balance the two approaches throughout the book? WS: It's a real life story so first you look at the facts. Each specific event has singularities, and it's those singularities that are open to interpretation. Whether you do it through allegory or hyperbole, or realistically, as long the approach advances the goals of the story and concepts behind the book. In short, the singularities of factual events inform how to approach them. CA: A lot has been written and said about Jordan over the last 30+ years, from his college days to his current position as an NBA team owner. What, if anything, do you hope to convey with this book that you feel hasn't been said?